The Spawn points are located on inaccessible points of the map which allow a fairly wind window to access the battleground. Following the track to the right will lead to a drop off and a raised ramp which allows players to attack from behind cover, continuing to follow the track will lead into the enemy's side. Following the track to the left, will access the opponent's primary access point to your team's side. The Splat Zones is located at the center of the map on top of the hump. Inkrails have been added to make getting to the center of the map faster. Blocks to the side of the map making access to the opposing team's side harder. The Tower is located at the center of the map on top of the hump. The tower will move at an angle left down the hump before traveling through the alley then going up into the enemy base where it will reach its goal. Blocks to the side of the map making access to the opposing team's side harder. The first checkpoint is immediately off the hump. The second checkpoint is located after the tower has traveled the entire span of the lower alley just before it raises into the enemy territory. The Rainmaker is located at the center of the map on top of the hump. The goal is located at the far end of the opposing team's side, being located as far the opposing team can go. Unlike other maps which may offer multiple paths to reach the goal, Humpback Pump Track only offers a single point of entry, being going around from the right track. Inkrails have been added to make getting to the center of the map faster. Blocks to the side of the map making access to the opposing team's side harder. The basket on this map is located at opposing ends of the central area making access to the basket fairly easy. Blocks to the side of the map making access to the opposing team's side harder. Humpback Pump Track was released with launch of Splatoon 2. 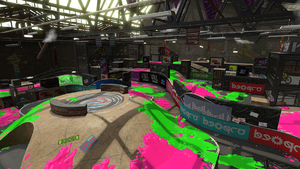 Modified Humpback Pump Track takes place on Octoling Assault, an Octo Canyon mission. Adjusted placement of objects in Tower Control. Greatly adjusted the path of the tower. Added Inkrail from each team's base toward the center. Additionally, adjusted placement of things such as obstacles. Fixed an issue in Humpback Pump Track causing bombs and players to clip into stage features in the middle of the stage. The stage name is a reference to humpback whales and pump tracks. The internal codename for this stage in the game files is "Wave". This page was last edited on 26 February 2019, at 16:51. This page has been accessed 20,986 times.